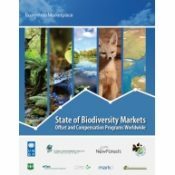 This report provides the status and trends of biodiversity offset and compensatory mitigation programs by geographical region. In each section, the report summarizes the total active programs and developing activities, and broad metrics like total known payments and land area protected or restored. In each region, we also analyze the characteristics of offset programs—what drives the program, how offsets are created, who the buyers and sellers are, and what the unit of credit is. Finally, we look at recent developments in nascent and existing programs in the region. The reliable, consistent and transparent information provided in this report will enable both experienced and new market participants to make more informed decisions and learn from the experience of others; ultimately allowing fair, stable and transparent conservation markets to develop.